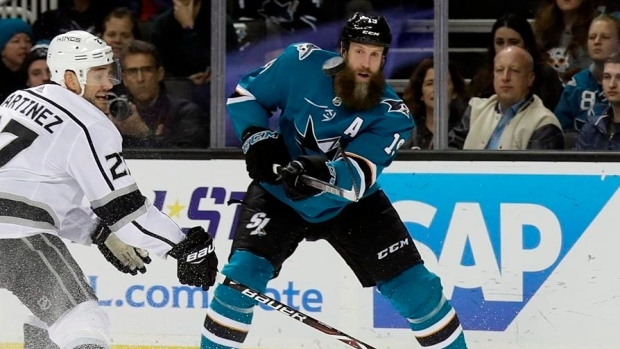 San Jose Sharks forward Joe Thornton received positive news Sunday on the knee injury that led him being placed on injured reserve. Thornton, who has torn the ACL and MCL in both of his knees over the past two seasons, is dealing with an infection in his right knee and it is not a new injury. Thornton, 39, was limited to just 47 games last season and said last month he wasn't fully healthy until November due to the damage sustained to his left knee prior to the 2017 playoffs. He then tore the same two ligaments in his right knee in January. He has one assist in two games with the Sharks this season. The team was shut out against the New York Islanders on Sunday and DeBoer said Thornton's absence can't be used as an excuse. Thornton will miss at least the remainder of the Sharks' four-game Eastern Conference road trip.